Segregation on buses in Alabama officially ended on November 13th, 1956. In 1955 the rule on the buses in the city of Montgomery, Alabama, was that ‘coloured’ passengers must sit at the back and leave the front seats to white passengers. In December a black woman in her forties named Rosa Parks, long active in the civil rights movement, declined to give a white man her seat on the Cleveland Avenue bus. Her action, apparently, was spontaneous: she said her feet were tired. The bus stopped and she was arrested and fined $14. Montgomery’s black leaders called for a boycott of the city’s buses and the recently appointed pastor of the Baptist church in Dexter Avenue, Rev Martin Luther King Jr, was picked to head a committee to run the boycott and secure publicity. Then virtually unknown, he was superbly suited to the task and the outcome would be a notable victory in the civil rights battle and a worldwide reputation for Martin Luther King. The battle was waged principally over education and had started earlier with legal challenges to the system in several states. The old principle of ‘separate but equal’ facilities for whites and blacks, endorsed by the Supreme Court in 1896, had been rejected by the court in 1954 in relation to the public school system in Kansas. The reaction in many states in the South was punningly called ‘massive resistance’ and desegregation of schools proceeded patchily, but gradually the decisions of the federal courts took hold. Meanwhile, Martin Luther King’s principle of non-violence as ‘the most potent technique for oppressed people’ was proving effective in Montgomery. More than 90 per cent of Montgomery blacks joined the boycott, which was copied elsewhere in the South. Black people formed car pools to get to work or walked, and downtown shops complained of losing business. In March 1956 King was fined $500 for conducting an illegal boycott. In April the Supreme Court ruled against bus segregation and the Montgomery bus company, which was losing money, tried to comply, but was overruled by the local police chief. In June the federal district court in Montgomery ruled that the city’s segregation ordinances were unconstitutional. The ruling was upheld by the Supreme Court in November and the following month the city announced its compliance. 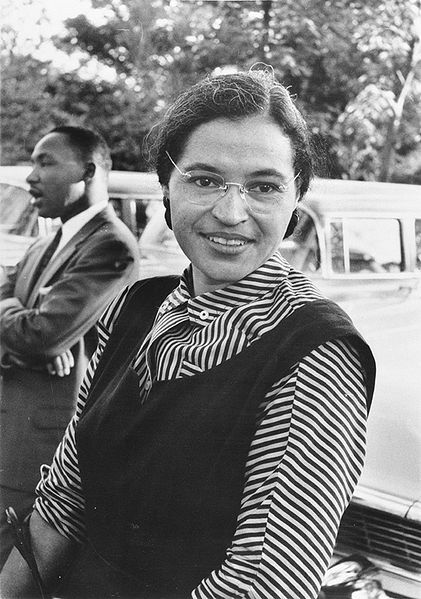 Rosa Parks posed for photographers, near the front of a bus with a white man further back.